In September of 1939 Yugoslavia declared itself neutral in the new war that was sweeping across Europe. However the dogs of war had already been howling for sometime in Yugoslavia. After the last "Great War" the Powers of Europe had carved up the territories once held by the Ottomans and Austrians. The failure to take note of the ethnic and religious differences that officially demarcated the region of the now Yugoslav kingdom was coming back to haunt the region. Croatia was just the first dog to bite. In March of 1941 the Yugoslavia signed the Tripartite Pact sealing its desire to be left out of the war. Yet no matter how often Yugoslavia assured the Axis, Germany especially, that they would adhere to the treaty the Axis didn't seem to believe them. This suspicion was fueled in part by Yugoslavia's leadership at the time. It was also fueled by Croatia's flirtation with the Nazis. Upon Germany's invasion of Yugoslavia on April 6th of 1941 the Croatian political class began to maneuver for an independent state within the Third Reich. Only four days later, on April 10th, the Croatian politicians got exactly what they wanted as Germany allowed Croatia to declare itself independent of Yugoslavia. However Croatia would be expected to fall in line with Hitler's Europe. A catch in the agreement that Croatia's Ustase party was far too willing to take part in. The Ustaše were Croatia's ultra fascist political party that had come to power by taking advantage of the economic depression which hit small economies like Croatia's disproportionately. They had realized that without implementing extreme policies like those of Hitler's Croatia would not be able to recover. Thus Croatians across Yugoslavia began to flock to the party. After all, this was the party that was promising the moon (for Croats only) and linking the Croatians to Aryans. For the Jews, Roma, Homosexuals, Handicapped, or Mentally Handicapped this call to arms was the sound of the clock striking midnight. The darkness of the Holocaust was now spreading across Croatia and over all the rest of Yugoslavia. There was nowhere left for Yugoslavian Jews to run. Europe had been devoured by Hitler's army. Croatia was simply driving the final nail into the coffin. In Croatia the Holocaust came in a unique manner. 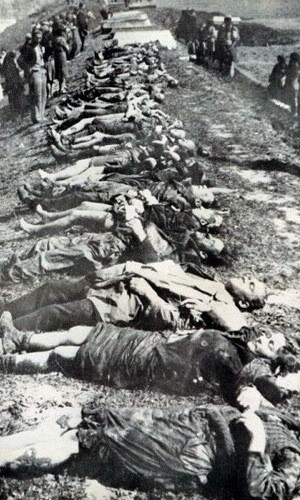 The German SS weren't the main presence at death camps like Jasenovac. 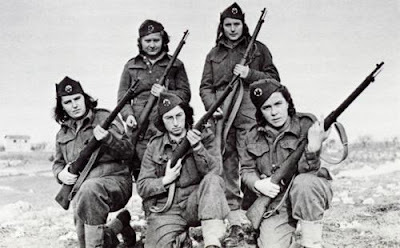 Instead the Croatians, almost as a whole, were the leaders of the operations to slaughter the Croatian Jews and Romani. With their ruthless Ustaše, the Croatians employed massacres using axes, hammers, and at times their own hands. Many Ustaše leaders were known to grab children up by their legs and bash their heads against walls as a means of instilling fear among new inmates. In Croatia the Holocaust was almost more personal than it was ever meant to be. All across Europe Jewish businesses were confiscated and handed out to loyal Nazi party members. The Legal Decree on the Nationalization of Jewish Properties and Jewish Companies of October 10th, 1941 made it far to easy for any Croatian to claim ownership of their neighbors home or their competitor's business. The government of Croatia also stated that it would not prevent or prosecute the blatant murder of Jews and Roma within Croatia. Thus allowing even noncombatants to engage in the Holocaust in as much a role as the Gestapo of Germany. Across the border in Bosnia the Croatians lend Ustaše commanders to the "Grand Mufti's" Bosnian SS units. These Croats were eager to work toward the goal of cleansing not only Croatia of Serbs, Jews, and Roma but also wanted their borders cleared of any future resistance. The compromise here was simple, work with Muslims and Arabs or allow Bosnia to fall to the Yugoslav partisans. In further support of Hitler's goals the Ustaše and Croat politicians ordered the construction of Koprivnica, Pag Island, Jadovno, and Kruščica death camps. These camps were raised in the spring of 1941 and each would continue their industry of death and murder till October of 1942 when Jasenovac is fully operational. However unlike in Germany and Poland, the local politicians did not wait for the German Nazis to order the construction of the said camps. In Croatia it seemed to be a status symbol for the politicians in the new regime to have a concentration camp operating in their region of the state. 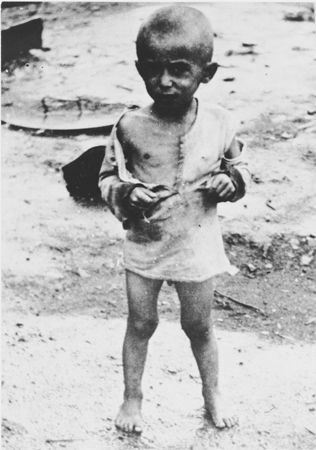 From August of 1941through February of 1942 the Ustaše established the Jasenovac camps: Krapje, Bročica, Ciglana, Kozara, and Stara Gradiška. This group of satellite camps would rival the horrors of Auschwitz and Dachau. And at its heart was the aim of killing all of Croatia's Romani community as well as importing Serbian and Bosnian Roma. The Jews of this area were often sent off to Auschwitz as the war came to a close so as to make room for Roma and Serbian prisoners. The Ustaše camp guards however did not readily send off their prisoners. Instead the Croatian SS were notorious for working for days on end as they carried out massive executions of prisoners to decrease the number of victims needed to be sent out to German concentration camps. Guards in Croatia were renowned for their lack of concern for the health of the inmates kept in their camps. Thus extraordinary cruelty, even by Nazi standards, was often overlooked by Ustaše SS units. It wasn't till September of 1941 that the Ustaše even began to admit that they could not kill all the Jews in Croatia without some form of help from Germany. Thus from September of 1941 through March of 1942 the Ustaše establishes the Ðakovo, Tenje, and Loborgrad camps. All three served as transit sites for Croat Jews whom Croatian authorities turned over to the Germans for deportation to Auschwitz. In many cases the Holocaust in Croatia was not stopped until Yugoslavian partisans under Tito were able to overrun the camps. In select cases the local Croatian authorities would dismantle the death camps and attempt to hide their crimes as the partisans approached. These cases were often induced by the sheer fear of reprisals that often marked the liberation of camps by Tito's militias. In most cases however the Croatian SS and Ustaše combatants would fight tooth and nail to keep hold of their villages and the camps they supported. 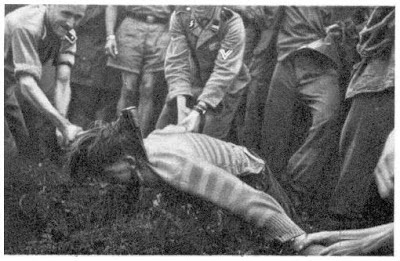 The Yugoslav liberators were amongst the few groups of liberators that seemed to not be surprised by what they found upon entering Croat death camps. Tito's Army had been told what awaited them when pushing back the Mufti's SS and the Ustaše forces. In every village they entered the Croatian fascist had turned the basements and cellars into miniature death camps. Through the entire liberation of Croatia the Ustaše forces carried out a scorched earth campaign as they withdrew. And just as the Germans would do as the Russians approached Berlin, Croat forces would leave stragglers to "nip at the heels" of the "barbarians". Of the nearly 40,000 Jews that lived in Croatia at the outbreak of the Holocaust only around 9,000 would survive its rapid spread across the new state. For the Roma the Porajmos (the devouring) in Croatia was just as horrific. The land that many Croat Jews had loved and been loyal to had nearly erased three quarters of their community. And to make things worse, the Catholic Church (which remains a major part in Croatian politics) had played a major role in this horrific act of genocide. On May 5th, 1945 the Legal Decree of the Equalization of Members of the Independent State of Croatia Based on Racial Origin was passed and repealed the race laws imposed by the Ustaše. For many this was the sign that signified the end of the Holocaust in their homeland. It would, in a legal sense, insure at least some safety for the Jews still living in Yugoslavia. Yet the wounds inflicted upon the Yugoslavian community by the Ustaše would never truly heal. For forty years the Balkans remained the "powder keg" of Europe. The sins of the Ustaše remained like scars upon Croatia and its neighbors. And in 1995 the horrors carried out by the Mufti SS and Ustaše would come back to surface once more. Proving to the world once again that if we never learn from history we will always find a way to reenact our mistakes. Without addressing the sins of our fathers we will surely repeat their misdeeds.